I am currently taking 1 of these per meal along with Digest Gold enzymes and Nutricology Ox Bile. In conjunction, I don't feel the food is just sitting in my stomach like it used to feel. I never let myself run out of Betaine HCI & Pepsin by Thorne Research. I take two at every meal to kick start digestion and secretion of pancreatic enzymes and bile. Use with caution if you have a history of peptic ulcer disease. My integrative doctor put me on Betaine HCI & Pepsin by Thorne Research about 8 years ago, when it was found that I had hardly any stomach acid. I take two per meal, three if it's a big meal like Christmas or Thanksgiving, and it really helps! 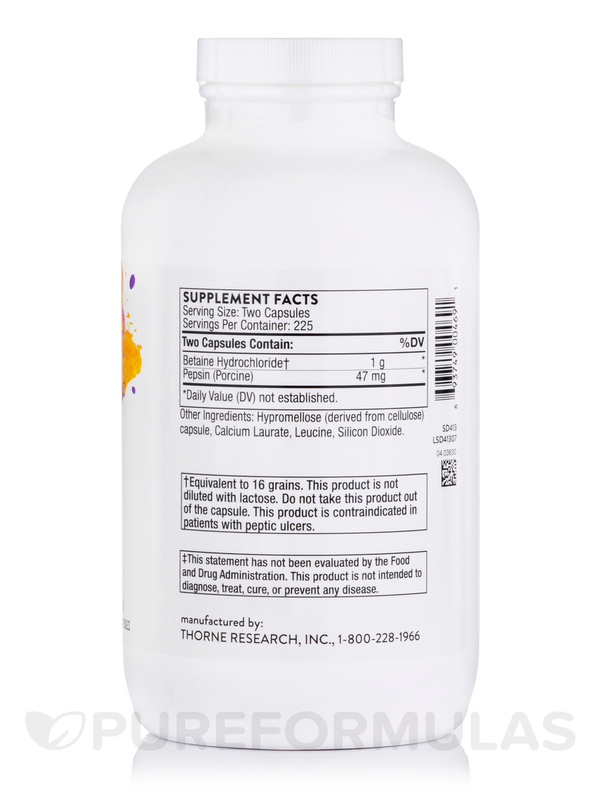 Betaine HCL & Pepsin promotes optimal stomach acidity‚ protein digestion‚ and enzyme activity. Indigestion can be caused by many things – including inadequate amounts of hydrochloric acid (HCL) in the stomach. HCL secretion in the stomach does several positive things. It assists protein digestion by activating pepsinogen to pepsin‚ it renders the stomach sterile against ingested pathogens‚ it inhibits undesirable overgrowth in the small intestine‚ and it encourages the flow of bile and pancreatic enzymes. Hydrochloric acid also facilitates the absorption of a number of nutrients‚ including folate‚ vitamin B12‚ ascorbic acid‚ beta-carotene‚ iron‚ and some forms of calcium‚ magnesium‚ and zinc. Numerous studies have shown that hydrochloric acid secretion in the stomach begins to decline with advancing age. Overuse of antacids or acid blockers can also lead to low levels of hydrochloric acid in the stomach‚ which can result in poor protein digestion. 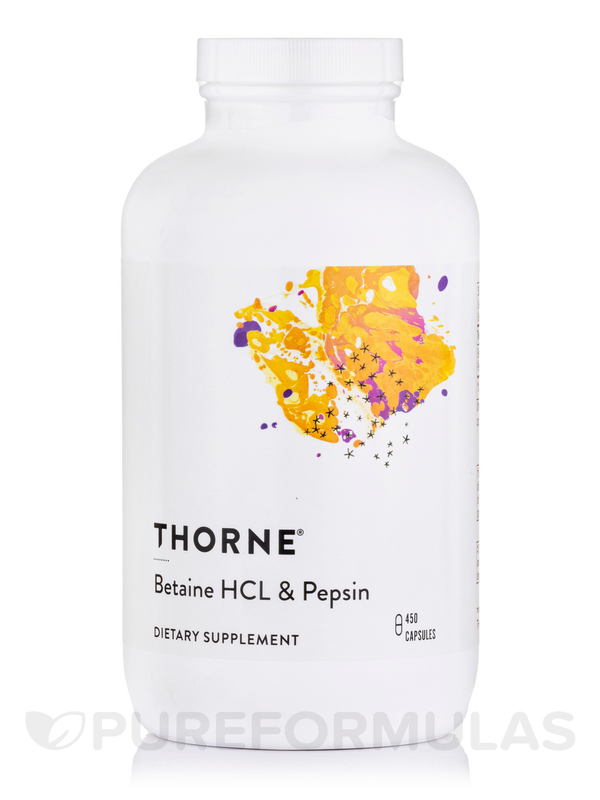 Thorne's Betaine HCL & Pepsin comes from a porcine source. Indigestion affects millions of people every day. For some‚ it's brought on by eating fatty foods. For others‚ simple carbohydrates (like bread and pasta) can cause gas and bloating. And for other individuals‚ spicy foods can cause them grief. Although what we eat greatly influences the frequency and severity of indigestion‚ this discomfort could also be related to an underlying problem – low hydrochloric acid (HCL) content in the stomach. Situations such as illness‚ gall bladder removal‚ overuse of antacids‚ and normal aging can contribute to insufficient secretion of stomach acid‚ which can adversely affect digestive enzyme activity and lead to occasional indigestion‚ gas‚ bloating‚ and other forms of gastrointestinal discomfort. Maldigestion can also lead to digestive problems and poor absorption of nutrients‚ resulting in vitamin deficiencies (particularly fat-soluble vitamins like vitamins A‚ D‚ E‚ and K). Food allergies can develop when inadequately digested proteins are absorbed through a leaky gut. As large proteins are absorbed intact‚ the body might recognize them as foreign and create antibodies against them‚ resulting in an allergic response to the food. 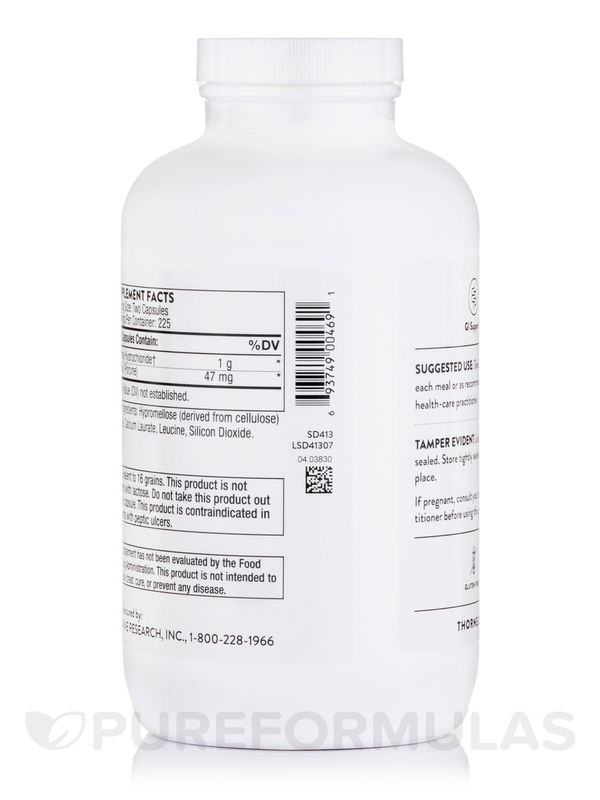 To ensure optimal digestion‚ an individual should make sure to have adequate HCL content in the stomach. Other Ingredients: Hypromellose (derived from cellulose) capsule‚ Leucine‚ Silicon Dioxide. *Equivalent to 16 grains. Betaine Hydrochloride derived from a non-plant source. This product is not diluted with lactose. Individuals with porcine allergies should not take this product. Do not take this product out of the capsule. This product is contraindicated in patients with peptic ulcer. Betaine HCL & Pepsin should not be used concurrently with H2-blocking drugs and proton pump inhibitors‚ because these drugs are intended to block the production of stomach HCL. It is not recommended to remove the Betaine HCL & Pepsin powder from the capsule‚ as it can be irritating to the oral mucosa. Stomach acid was too low! The capsules are larger, but easy to swallow. They don't upset my stomach, but help with food digestion. 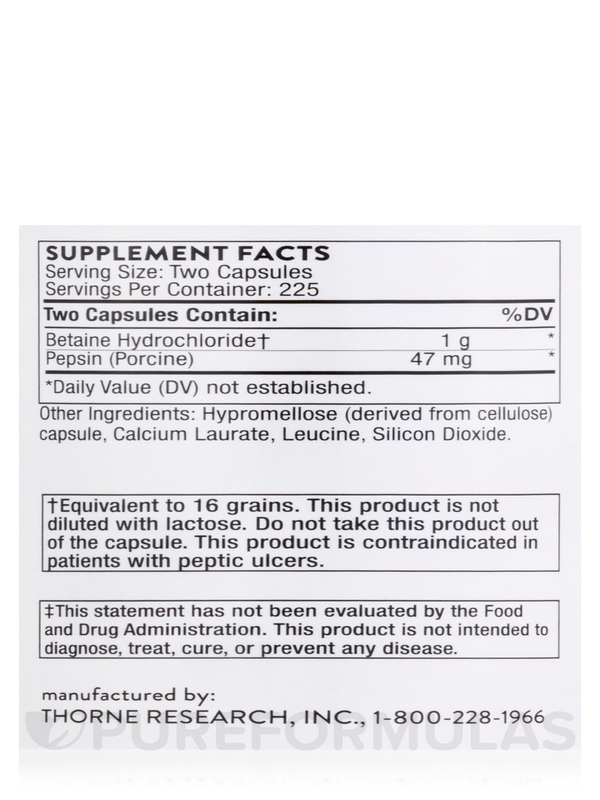 Love that Betaine HCI & Pepsin by Thorne Research doesn't have other fake filler ingredients. Just Betaine HCI and Pepsin.... Nothing else! 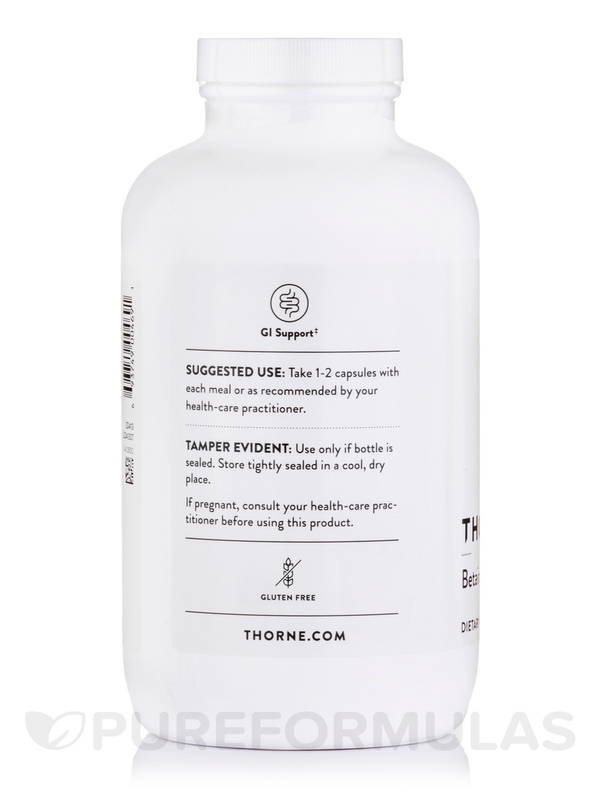 I use Betaine HCI & Pepsin by Thorne Research for digestive issues. I need to take a lot of these per meal, so the cost adds up, but does not contain any nasty fillers, etc, so this one works for me! No fillers like starches, sugars, etc. Bigger bottle so lasts a little while. Cost add up quickly given amount I need to take. I was prescribed Betaine HCI & Pepsin by Thorne Research but I take 15 pills with each meal. I feel the burning when I take too much, but I don't feel different with digestion and bloating. Recommended for the SCD diet. I would like larger containers as I go through so many each meal. My Functional Medicine Dr said to use Betaine HCI & Pepsin 450 by Thorne Research to increase my digestive acids. I'm now on my second bottle. I had to increase my tablets at each meal until I found after 15 minutes of waiting, my stomach felt funny. Then cut back by one. I did and it helps. It's worth a try. I'm only in my second month of an elimination diet, so we'll see how fast my digestion cooperates. I've tried other brands and always come back to Thorne Research for Betaine HCI & Pepsin. Other brands leave me bloated, and I generally have bloating when I don't take these enzymes. These enzymes have dramatically improved my quality of life! My husband was put on an elimination diet about 6 months ago and we also were advised to start a digestive aid with meals. We had already chosen Betaine HCI & Pepsin by Thorne Research and still use it daily! We ran out for a short time and ugh! We had difficulty with digestion again! Anyway, as we age, our digestive acid is reduced, not increased, so that little purple pill is the wrong direction! Thanks for carrying Betaine HCI & Pepsin! Ease of use and aid in digestion. Wish it was a little cheaper, since we use it every day! Again, I know they make a bigger size - at least 625 capsules - is this available? Why can't I find it here?? Hi Bridget thank you for choosing Pureformulas.com, we apologize but we do not carry the 625 capsule count for this product.